Where do you usually eat your lunch? 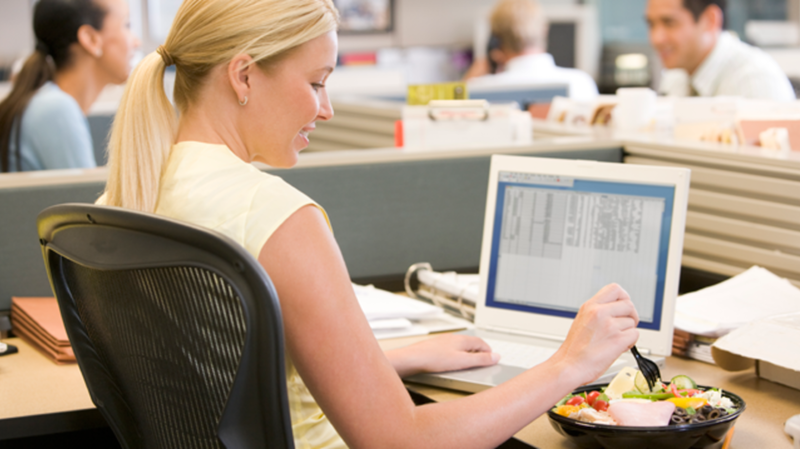 If you work in an office, chances are you eat at your desk, slogging through your workload while trying not to get too much salad dressing on your keyboard in the process. Just one in five of us actually take any lunch break at all, and research suggests all this desk time is hurting our health and lowering our productivity. A recent study put this anecdotal hypothesis to the test, asking participants to go for a 30-minute midday walk three times a week over a span of 10 weeks. The researchers equipped participants with a smartphone app that recorded their mood level, workload, tiredness, and motivation before and immediately after the walks. The results? The lunchtime strolls lowered employees’ stress levels and made them feel more enthusiastic about their work. A follow-up study showed these breaks also made participants feel more confident about their performance at work. “Walking therefore seems to have both energizing and relaxing properties in the workplace,” says Cecilie Thøgersen-Ntoumani of Curtin University, who led the study. So what’s going on here? What’s the secret of the lunchtime stroll? It turns out that just putting some space between you and your workload has a restorative effect on your brain. Previous studies have shown that employees who regularly take breaks during the workday are actually more productive than their workaholic counterparts. And physical exercise, even just a leisurely stroll around the block, tells the brain to produce stress-fighting chemicals called endorphins, which could help explain why walking made this study’s participants feel more relaxed. "We know that creativity and innovation happen when people change their environment, and especially when they expose themselves to a nature-like environment, to a natural environment," Elsbach says. If you really can’t get out of the office, invest in a desk plant, which can serve as a mood-lifting substitute for actual outdoor foliage. And you don’t have to be outside to reap the productivity benefits of a lunchtime stroll, as research finds even walking around indoors can boost creativity some 60%. So the next time you’re feeling depleted, the least you can do is take a stroll down to accounting or tackle a few flights of stairs, and say no to the sad desk lunch. Your boss and your body will thank you.